Compare prices on car hire in Dallas from all the major brands and find the best deals. When you book through us, unlimited mileage and insurance are always included in the price given. Dallas is located in the southern parts of the USA (360 km from the Gulf of Mexico), and is the 3rd largest city in the state of Texas – with 1.2 million inhabitants (2008). The city lies on the River Trinity River and has a subtropical climate. Lake White Rock Lake in Dallas is one of the city’s landmarks, which is an important recreational area for boating and outdoor activities. The park surrounding the lake is popular with joggers and cyclists. This is also the “Dallas Arboretum and Botanical Garden” – with beautiful and unique plants and trees. The city center is dominated by high-rises and skyscrapers, where several of the buildings exceeds 200 meters. The highest is the Main Center, which measures 280 meters. 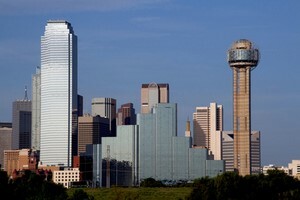 Of the city’s tourist attractions have “Dallas Museum of Art” is mentioned. Art Museum has more than 23,000 works from around the world, from antiquity to modern times. Otherwise, the city opera, zoo, aquarium, shopping and numerous nightlife spots. John. F. Kennedy was assassinated in Dallas in 1963, and the scene’s JFK Memorial Plaza – which has many visitors. The city’s airport, Dallas – Forth Worth International Airport , located approx. 34 km northwest of downtown, and is one of the world’s busiest.